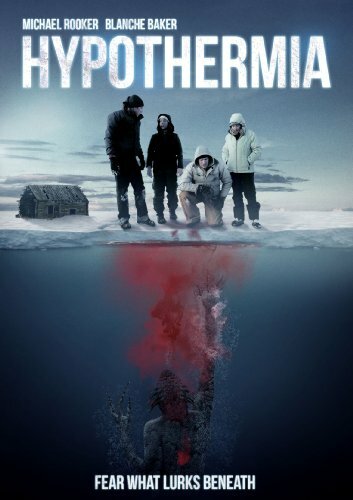 A family returns to their favorite winter getaway for some peaceful ice fishing little suspecting that they are about to become bait for a hideous underwater creature in Hypothermia , a bloody and bone-chilling shocker coming to DVD from genre specialists Dark Sky Films and MPI Media Group on October 2, 2012, with an SRP of $24.98. Ray Pelletier (Michael Rooker, The Walking Dead, Henry: Portrait of a Serial Killer, Slither) is looking forward to a quiet weekend of ice fishing with his family at the same peaceful lake they've been visiting for years. Unfortunately for the Pelletiers, the obnoxious big-city father-son duo of Steve and Stevie Cote has picked the same weekend to spend at the remote frozen spot. The fishermen quickly notice that the fish below the thick ice aren't biting, and Ray thinks the Cotes' state-of-the-art gear, including a loud ice drill, has scared them all away. But the two families' petty squabbles are soon eclipsed by a much greater enemy: Something unnatural and ferocious is under the ice and its prey is human. Miles from civilization and with only a few inches separating them from the freezing water below, the Pelletiers and the Cotes must find a way to work together to fight the vicious creature that's out to hunt them. Directed by James Felix McKenney (Automatons, Canniballistic, Satan Hates You) and produced by the creators of new cult classics The House of the Devil, The Innkeepers and Stake Land, Hypothermia is as taut as a fishing line snagged by a barracuda. This modern spin on the classic monster movie features memorable performances from horror vet Rooker and co-stars Blanche Baker (Sixteen Candles, The Girl Next Door) and Greg Finley (The Secret Life of the American Teenager).